The Archdiocese of St. Paul and Minneapolis’ plan for reorganization, including a $210 million settlement for victim/survivor remuneration, was approved by a U.S. Bankruptcy Court judge Sept. 25. 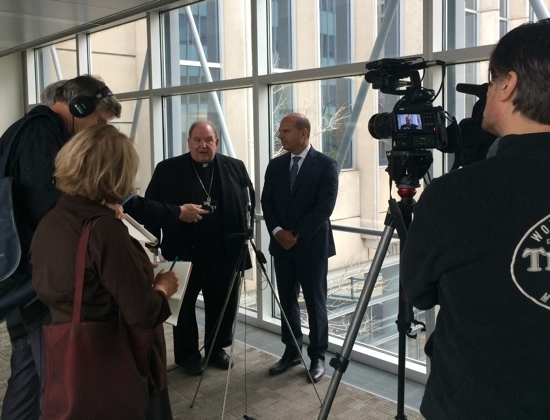 During the hearing at the U.S. Federal Courthouse in Minneapolis, Archbishop Bernard Hebda gave a statement not as a lawyer, he said, but as the shepherd of the archdiocese. The archdiocese filed for Chapter 11 bankruptcy in January 2015 amid mounting claims of clergy sexual abuse following the Minnesota Child Victims Act, which lifted for three years the statute of limitations on historic claims of sexual abuse. In what U.S. Bankruptcy Judge Robert Kressel, who oversees the case, described as a “longer than expected” process during the hearing, the archdiocese and a committee representing victims/survivors filed competing plans in 2016. In December 2017, Kressel denied them both and ordered the parties to return to mediation. On May 31, they announced that they had reached a consensual plan. The archdiocese will also pay $1 million annually for five years to the trust established for distributing funds to victims/survivors. Tom Mertens, the archdiocese’s chief financial officer, testified during the hearing that the archdiocese is prepared to fulfill its commitment. A trustee appointed by the committee representing victims/survivors will determine the proportion of the funds each claimant will receive. A portion of the funds is expected to be distributed by year end. The archdiocese will likely be formally discharged from bankruptcy in December. Jeff Anderson, a St. Paul attorney representing some of the victims/survivors, called the plan confirmation “a turning of a page” in survivors’ journeys, and he told them they should feel like they have taken steps to protect children. “Today was the first affirmation [of] that request that I’ve heard,” he said of the confirmation hearing.